Two new Francis Quirk paintings have surfaced from a relative of Francis Quirk. This post will focus on the first; a nautical painting. Quirk's summer home, Peterspen North was in Kinney Shores, Maine and he looked forward to spending time there after his retirement from Lehigh University. We suspect that this painting was executed during one of his many summers on the rocky maritime coast. We were particularly excited to see this painting of two fishermen heading to sea for two reasons beyond adding it to our growing image library. The first is that it is an attractive painting with an ethereal quality to the sunlight that is particularly pleasing. The ocean has not yet taken on a blue color, but is still reflecting the light of the rising sun. The second reason is that we have an image of a companion painting. It is a darker composition of a boat heading in the opposite direction. 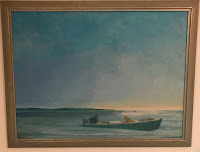 Yet in this companion painting, the sky has become fully blue and the outboard engine powered boat is riding much lower in the water. There also appears to be cargo in the front. 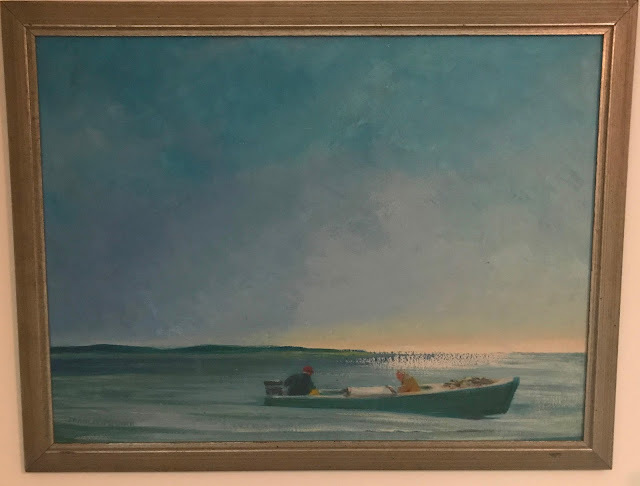 Francis J. Quirk Painting "Boat in an Ocean"
We display the paintings below in smaller format side by side for comparison.